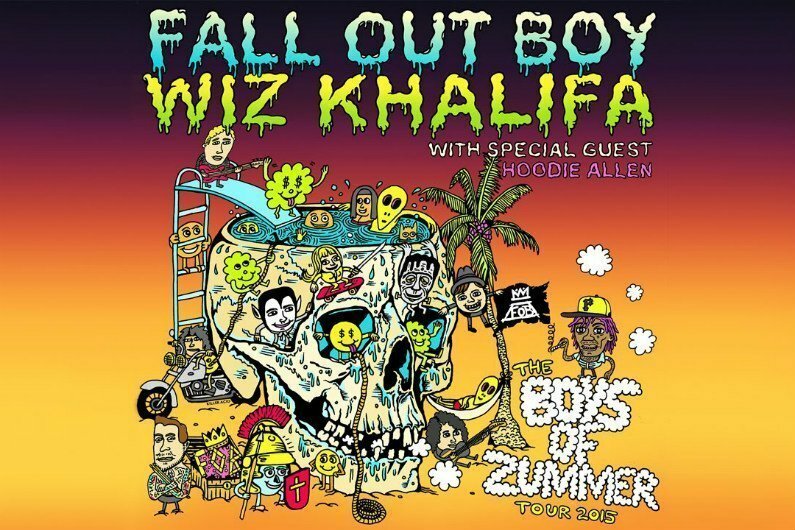 Wiz Khalifa and Fall Out Boy might seem like unlikely touring partners, but the hugely popular hit-makers will be teaming up for the Boys of Zummer 2015 Tour. Hoodie Allen will be the opening act, with DJ Drama and DJ AM on the bill for select dates. Face value tickets are going for $86 to $27 for the cheapest of the cheap seats. When do Wiz Khalifa & Fall Out Boy 2015 tickets go on sale and what is the presale code? Each date can be different, so check the primary ticket links below for the most up-to-date information. The first presales and VIP ticket sales begin on January 20th. The Artist / Fan Password is BOYSOFZUMMER2015, the Live Nation Presale code is HEADLINER and the Mobile App Presale code is COVERT. The Facebook presale is on January 22nd, with that code still private. Tickets go on sale to the general public on January 23rd. For their latest music, news, and tour dates, check out the Wiz Khalifa and Fall Out Boy pages here on Zumic by clicking those links.